In mythology, Andromeda is the daughter of King Cepheus and Queen Cassiopeia. She was forced to be chained to the rocks of the seashore to be devoured by the sea monster, Cetus, as a punishment for her Cassiopeia’s sin of bragging on her beauty. She was saved, however, by Perseus who arrived just in the nick of time with the head of the terrible Med usa, with which he turned the sea monster into stone. Whew! What a story! But it’s interesting when you consider WHO these creatures really represent. Perseus, whom we will study later, represents Christ. And, as we’ve already learned on The Band page, Cetus represents Satan. Now, we will learn that Andromeda represents the Church — Jesus’ beloved, His bride. So, the story actually does play out in reality. Perseus rescued His precious Andromeda from Cetus over 2000 years ago on a cross. But let’s get back to our star revelation! As a quick review, remember that with the constellation of Pisces (of which Andromeda is a decan) we are observing the fact that followers of Jesus Christ will have conflict. These trials and temptations that lead to sin stem from three sources — the world, the flesh (our own desires), and the Devil. The three entanglements are represented by The Band that connects Pisces (us) to Cetus, the sea monster (Satan). And now, with Andromeda we observe the results of those struggles. This is a picture of an overweight woman chained in weakness to a three-natured beast. What an accurate picture of the modern-day Bride of Christ. Her abundance of wealth has caused her to stop trusting her Lord and start desiring after the three-faceted sources of sin — the world, the flesh, and the devil. Notice, too, that she appears to be looking longingly toward her Lord, the King represented by Cepheus. Truly that should be her desire — not only in the battles but in all areas of her life. And not just the blessings and mercy He provides — but simply Him! We saw in the last decan (The Band), that the band is actually weak and has no real authority and power in our lives. This is true only because we are abiding in Christ. We have died with Him, thereby dying to the law of sin and death. So why do we continue to experience conflict? Because we still choose, from time to time, to be subject to that old nature — that old law of death. That is the reason why our Lord’s death, burial, and resurrection must become ours too! We must learn to die daily to our old nature and choose to serve Him instead. Notice the reason for our sin — pride! 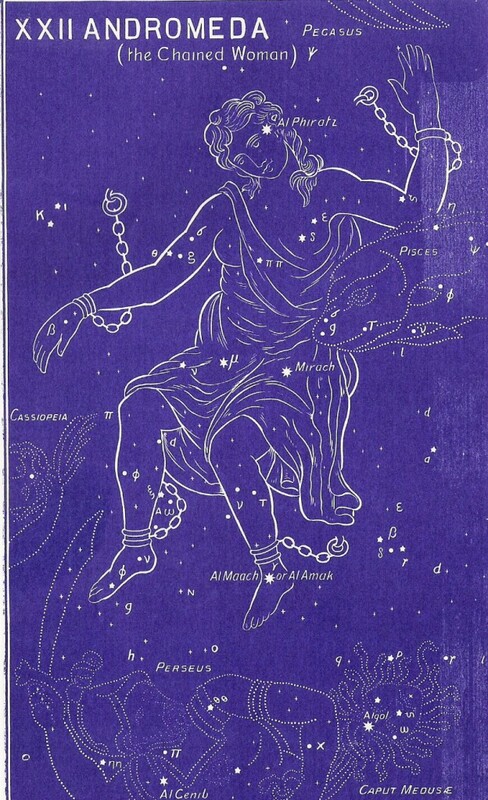 (Refer back to the mythology connected with this constellation). Cassiopeia’s (who also represents the church as we’ll learn later) sin was pride, and pride is always the forerunner to our fall into sin. Pay careful attention to the meaning of the star names. They will always back up the message in The Gospel Truth above. To continue in the correct order of the ancient star chart, please select Cepheus next. Be sure to download the Free e-book that discusses the historical, cultural and biblical evidences for this ancient star revelation.